SPT dishwashers are reliable and compact. 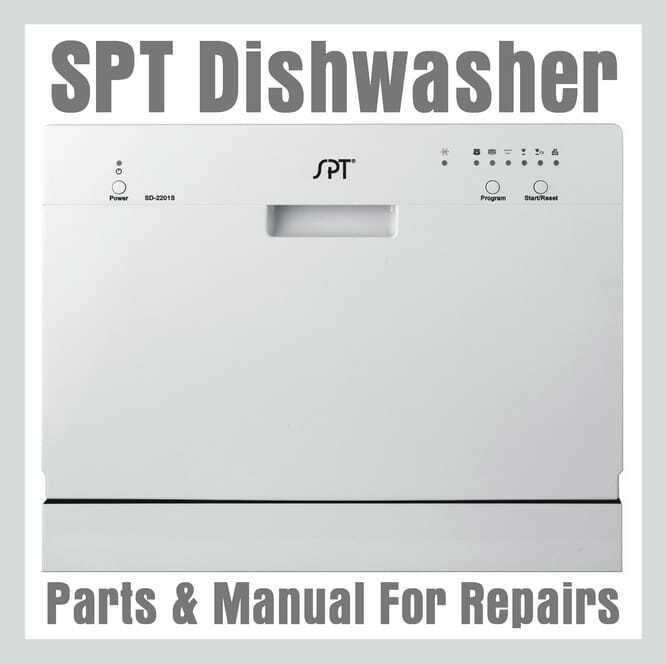 If you need parts for your SPT dishwasher to repair it yourself you can find them here. 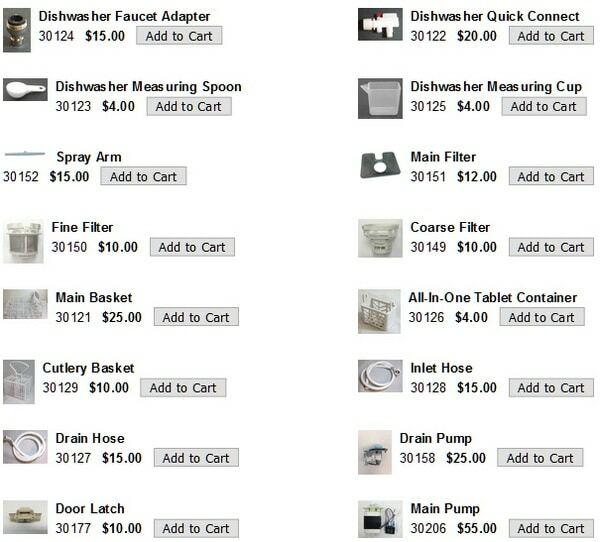 If your SPT dishwasher is leaking water or you need the faucet adapter, answers and parts can be found here. We will list all SPT dishwasher model numbers along with the manuals so you are able to do repairs and use the manual to troubleshoot problems. The place to get parts for all SPT dishwashers is Sunpentown. We will list the SPT model numbers below along with all the parts available to fix your dishwasher yourself. 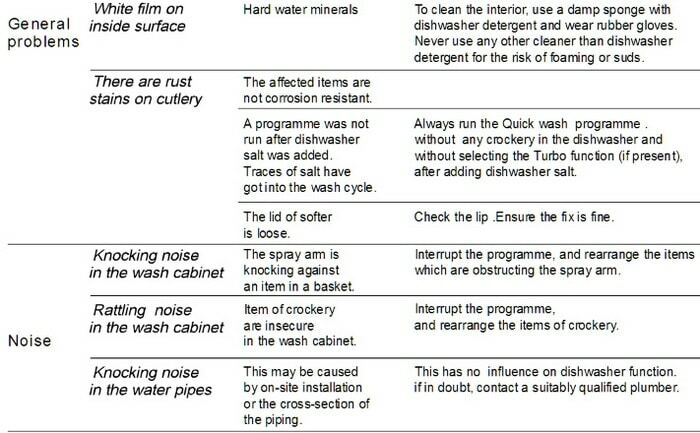 If your SPT dishwasher is leaking, see the image below as it shows all the parts that may be causing the leak. A part may be loose, cracked, or missing. Find any replacement parts using the parts links on this page. SPT Dishwasher Leaking – Check parts in image for where leak appears. 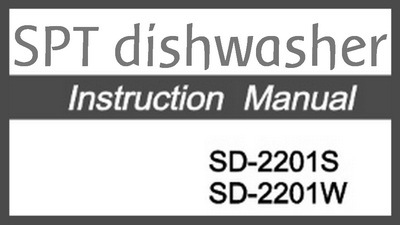 Here is a model number list for all SPT dishwasher parts. Click on the model number of your SPT dishwasher to find and purchase parts. If you need the SPT dishwasher faucet adapter, it can be found here (SPT faucet Adapter). 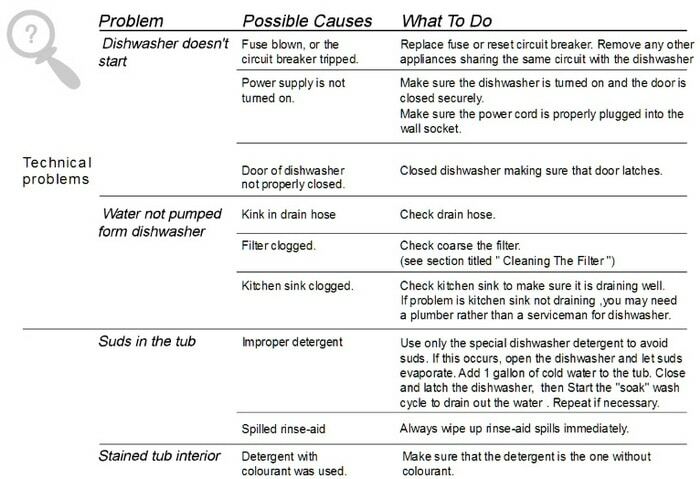 Here is troubleshooting for SPT diswashers. See the images below as they will show what the problem is and how to solve and fix the problem yourself. Below are error codes for SPT dishwashers. This small chart shows the 3 in 1 and glass light issues. If you need help with your SPT dishwasher, please leave your question below and we will assist you in troubleshooting the issue further. I have a countertop spt dishwasher. Worked great since 2015. I noticed now when I load the dishes the main basket touches the sprayer arm not allowing it to spin. Has the metal basket bent and sagged over time? Is this a wheel problem….what should I try first? Replace basket?or wheels? Manually bend it back? I have the SPT countertop 2201. Was working great for a few weeks and then faucet aerator keep popping of the faucet. My SPT SD-2225DW has an E4 error indication. There was an overflow of water inside. In the manual, it says to remove the water in bed pan before restarting, which I’ve done, but the error code won’t go away. I tried unplugging it overnight. And when I plugged it back in, it still is beeping with the code on and it goes through a cycle where it sounds like it’s running. It’s brand new. I’ve used it less than 10 times. I’m not sure what to do. Any help? Hello. I have the SPT SD2201W countertop dishwasher. It apparently will not finish a cycle. It runs, drains, etc. but will beep and not ever finish running. Any idea how to fix? SD-2201W will not start. The plug in the wall is hot. None of the lights will light. is there a fuse inside the unit? Hi, I have a SPT 2202 counter top dishwasher. I turns, drains water, starts to fill with water then stops in middle of that then the light 4th light flashes and beeps. Do you know how to fix this? Thank you! My amazing SPT SD-2224DS dishwasher has a malfunctioning start. I select the cycle the push start and it simply goes to he next cycle without starting. If the SPT dishwasher is flashing on GLASS CYCLE and it thinks there is an overflow, simply try unplugging the unit for 5 minutes to reset. There may have been a malfunction. 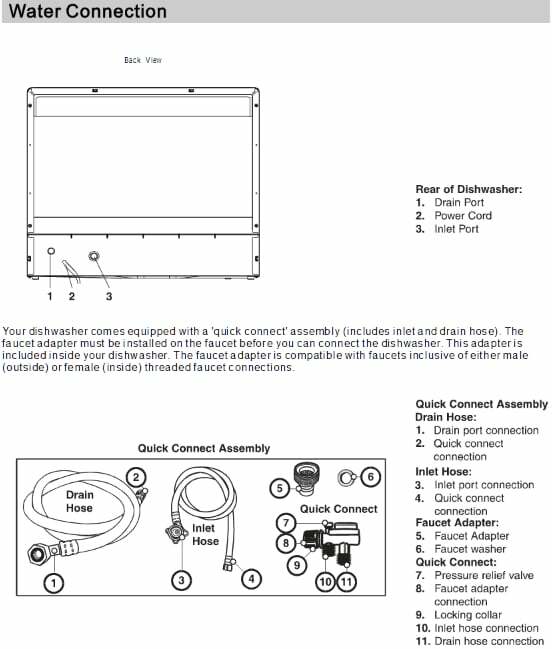 We have an SPT SD-9241W Energy Star Portable Dishwasher that is having issues with the faucet adapter. It worked fine for a couple of months but when I connected it this evening and turned on the washer, the connector hose blew off from the water. Now it’s finally working, but it’s leaking a bit of water. Do we need to replace the faucet adapter? The SPT countertop dishwasher run time is already over 1hr, on 3dish setting, has not stopped. I turned it off and restarted on the end setting that I thought was the drain dry, appears to be washing again, hopefully a rinse. When I turn on my ensue countertop dishwasher…. the setting goes to “ mini part” and blinks and beeps and I’m unable to switch settings…. any ideas? I tried my new dishawasher and the “mini party” mode light is flickering. I checked the manual and it says overflow. So I disconnected water source, unplugged it, dried the inside of the washer and tried to restart it but it will not restart. I also drained and cleaned the drain inside the washer and it still won’t restart. The washer was working until an hour after when the light flickering started. I called the number for support but the office is closed. What am I missing here? I have an SPT SD-2224DS that just started having issues. It will fill with water and drain the water but does nothing on the actual wash part of the cycle. We have cleaned out all the filters and still nothing. Any suggestions on what may be going on? It is just over a year old. I have an sd2224 I keep getting E4 error code. anything I can do at home to fix. We have a SPT Dishwasher SD2224DS and the water is not coming out of the spinner, it is just sitting in a pile on the bottom dishwasher. The water does drain through the hose, however, so I’m not sure what the exact problem can be. This means the sump at the bottom of your SPT Dishwasher is clogged with something. Take the racks out and check the very bottom of the SPT Dishwasher and remove anything that may be blocked and causing the dishwasher to not drain. The drain pump may be clogged so you may need to take it apart to find the issue. Make sure you remove power to the dishwasher before doing any maintenance to your dishwasher. Just bought the SPT countertop dishwasher and everything is working but the draining hose is leaking, you can see water shooting from the hose from the back. Tighten the hose or make sure there is an o-ring in it so the water is not able to escape. If that does not work, use plumbers tape. When I turn on my SPT dishwasher the programs perpetually cycle through. I can’t choose one or move beyond this point to start the dishwasher. I am not sure which model, it is stainless exterior, but the problem is I am getting the flickering glass light and it does not cycle for very long at all. I see no leaks anywhere. Hi! Pretty sure I clogged my SPT dishwasher by washing a food processor that had coconut oil in it. Stuff is tricky. Any ideas? We just purchased a SPT Countertop Dishwasher. It has been working great but tonight has started beeping incessantly. While Beeping all red lights are flashing. Why has this happened and what can we do? For now, we have it unplugged to sit and rest. My is doing the same. Door open or closed. I turn it on then it turns off then a few seconds later it turns back on. Then all types of craziness with the lights then off and on again. Absolutely nothing online about this. I unplugged the dishwasher and used an entirely new outlet fearing it was a grounding issue. I am just wondering if anyone found a resolution to this issue? I need a longer Drain and Inlet Hose for my SPT dishwasher like more around 8′, is that available and if not can you suggest where I can get one or have one made?? Any help you can give would greatly appreciated! Check the Dishwasher hoses on Amazon as there are many to choose from and one will be the size you need for your SPT Dishwasher. I have the SPT SD-9241SS portable dishwasher. It has been working fine but yesterday, it started dripping water from below the machine. It looks as if it coming out near the pre-drilled holes. It was a good amount of water. Not sure when it started leaking but continued after the normal cycle was over. It eventually stopped about 35 minutes after shutting off. I then tilted it this morning and water began leaking out again from the bottom. Could this be a faulty main washing pump or other problem. I would love to know how to fix it myself if I could and if it is likely a faulty washing pump, a link with directions on how to replace the main washing pump would be so helpful! thank you for any help you may provide! Most likely your SPT dishwasher has a loose drain pump hose. Remove power, remove cover, check that drain hoses are all tight and secure. Hello. I removed the cover and checked everything out. I do not see anything loose or cracked. I actually saw water dripping out of the main pump (almost from the center of it-not near any hoses). So I think I need to replace the main washing pump. The tag on it says Welling YXLW50-2A (motor ysk50-2). I see on your website that the main pump that looks like my pump is 30206 (funny thing is that this one is not under my model #9241ss–it is under #9252ss…. My SPT dishwasher turns on and door closes fine, but for awhile the start button has had issues. I usually have to hold it down for several seconds before it starts the washing process, and as long as a minute or two. Now i hold the start button down and NOTHING happens. It’s about a year and a half old. This SPT countertop dishwasher is making a constant loud noise only during the wash cycle. The noise sounds like it is the loudest in the back, bottom, left of the washer. I’ve taken off the houses and don’t see anything clogged. Do I have to take 100 screws off to get to the bottom of this? Does something need replacement or just cleaned? The washer is only a few months old. I am having this same problem. Is there an answer for this? I have a SPT dishwasher (countertop). I sent for a new board, didn’t work, sent for another board, this one doesn’t work either, the wire diagram they sent with it has colored wires but the colors don’t match, so any one help me out. Just need to know what colors go where. I have written them about his problem but no response. I have a SPT SD2202S counter top dishwasher, and it is taking up to 4 hours to complete the heavy wash cycle, which used to take less than 2 hours. It also isn’t cleaning the dishes. This had happened about a month ago, so I took out the filter and cleaned it, and it was working normally again. I cleaned out the filter again (although it wasn’t very dirty), but that hasn’t helped. I’ve tried other wash cycles, and they all seem to take twice as long as the owner’s manual says they should take. I checked all the connections to make sure there were no problems with the hoses, and those seem to be okay. If the SPT dishwasher is taking longer to WASH YOUR DISHES, this may indicate a timing fault. Can you inspect and or test the timing mechanism on the SPT dishwasher to be sure that is not the issue? How would I go about testing the timing mechanism? I’ve tried multiple different programs, and the only program that seems to run the correct time is soak. There is most likely a bad spot on the timer mechanism. Remove and replace the timer mechanism and the dishwasher should work as designed. I’ve tried running the dishwasher on different cycles, and the only one that seems to be finishing on time is the soak cycle, which runs for about 10 minutes. Is there another way to test the timing mechanism? It also isn’t washing the dishes – at the end of the wash, the dishes are wet, but are definitely not clean. My dish washer stops after the first cycle and has water in the bottom but won’t continue through the cycle so. If you restart it it will drain it and the go through the first cycle on stop again. Have cleaned Filters And hoses. My SPT dishwasher sd-2201w powers on and makes one beep and then all the lights blink one after another. Nothing works after this except the power button. I checked all the fuses i could find. One on the bottom panel was ok.
That SPT Dishwasher manual is about as helpful as a fork in my eye. I did call SPT earlier. They have no idea why it’s doing that and suggest I replace the main board. They said it is 35 dollars if anyone else is concerned about fixing their dishwasher. Also it just disconnects there’s no soldering involved. Thanks for letting us know, and yes that particular SPT Dishwasher manual is not very informative. Now others will know if they have the same issue with the SPT Dishwasher, that the main board is the reason and the price is affordable for a DIY fix. I have a small leak coming out of the bottom of my STP countertop dishwasher Model number SD-2202S. I did some troubleshooting and ran a 10 min “soak” cycle and had no leaks. But when I tried the “normal” wash cycle, it leaked a small stream of hot water out of the bottom of the unit. I noticed it leaking at two different times during what I’ll call the washing portion of the cycle. It always leaked hot water. Since it didn’t leak during the 10 min soak, and it always leaked hot water, is there a way to pinpoint where the leak may be? Inlet and outlet hoses seem to be working fine. I’d love to get this up and running and stop doing dishes by hand. I appreciate this page because it is hard to find resources on repair of STP countertop dishwashers. There may a pin hole in the drain hose under the SPT dishwasher and when HOT water runs through it leaks. It may be so small of a hole only HOT water going through it makes it expand and leak. Have you checked the hoses and lines under the dishwasher to see if you can pinpoint the leak? You may also have a gasket or seal that is leaking…. You need to look under the SPT dishwasher and find it. On my SPT dishwasher, I keep getting a beeping sound and a flashing light (the light on the far right side of the unit) and the unit drains and stops washing. There’s no indication which error I’m looking at…or how to fix. I’ve tightened things, I’ve loosened things, I’ve cleaned out the tubing, checked for blockages in the unit, and still get the same error. How do i fix this? The beeping sound and flashing light on far right side of your SPT dishwasher may mean the drain is clogged or drain issue. Try cleaning the bottom part of the dishwasher and the drain pump and drain hose as they may be blocked. For us to be sure about the flashing light and the beeping, please tell us which light is flashing (what is the name of the button flashing?). Also, what is the model number of your SPT dishwasher? Let us know and we will assist further. My SD-2201S Dishwasher is doing the same thing. The light on the far-right – I believe it’s called the Soak Programme Indicator – is flashing repeatedly and nothing is happening in my dishwasher. Be sure you have adequate water pressure going to your SPT Dishwasher or the program indicator will flash. Is water getting to the dishwasher? Check the water line going to the dishwasher to be sure it is receiving water. 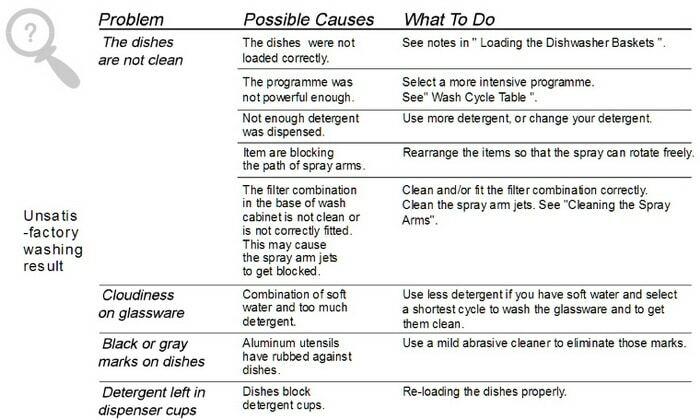 Previous post: Do I Have To Rinse Off My Dishes Before Loading Them In My Dishwasher?